Enjoy the spirit of the Florida Keys in this 'keysey' furnished condo with everything provided. All you have to do is show up with your shorts and swimsuit. Boat slip is included at no extra charge. You can be in your boat and heading out to enjoy spectacular fishing, diving, snorkeling, boating, or just cruising and watching the sunset in a flash. Located on Lower Matecumbe this condo is in the city limits of Islamorada....'Sport fishing Capital of the World'! This gated community is beautifully landscaped and has a beautiful pool, hot tub, tennis courts, and exercise room. Free wireless internet inside unit. (3) TV in Master Bedroom, Guest Bedroom, and Living Room. This wonderful keysey condo exceeded all our expectations. The location was perfect for our boating plans for the week. Having the boat dock right in front of the condo was an added perk. Loved the keysey atmosphere of the decor, made us northerners happy to be south! The condo was clean the beds were comfy everything was perfect. Thank you for choosing to stay with us and for taking such good care of our home away from home. 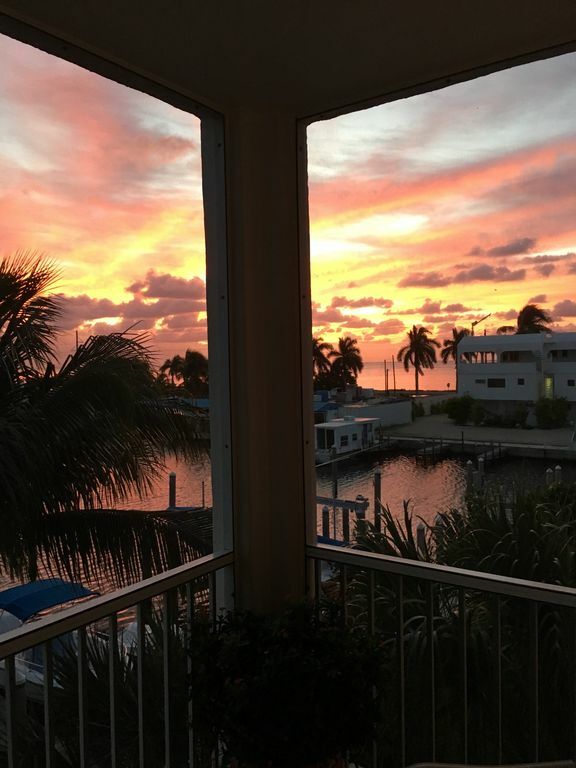 We would love to have you stay with us again should you decide to visit the Keys in the future! This "keysey condo" exactly as pictured with a wonderful screened in porch and lovely view right on the canal was everything we could have hoped for. Everything was very clean and in order. Loved sitting on the porch morning and evening to soak in the atmosphere of Islamorada. Johnna was always a text or email away with any questions we had from the moment we started the rental process. Thumbs up on this one. Thank you Johnna and Tim for having such a nice home for us to enjoy. This condo is always in pristine condition, beautifully decorated with comfortably furnishings. This visit there was updated paint and lovely "beachy" linens for the Master BR. It is roomy and has a terrific screen porch overlooking the canal and out to the Atlantic Ocean. A full kitchen with all needed accessories is available, if you don't eat out every meal like we do in Islamorada. This is our perfect spot in Paradise. We have stayed in this condo multiple times and it does feel like home. It is beautifully decorated, clean and comfortable. The kitchen is well equipped and the beds are as comfortable as ours at our own home. Johnna is responsive and timely with all questions - and in returning our deposit after following our stay. The location is near many restaurants and activites, yet far enough away from the downtown hustle bustle. We look forward to our next stay. Book early as her place is in demand! Thanks for your kind words! We are happy that you are comfortable enough there that yout think of it as “home.” We love having you as our guests and look forward to your next stay!!!! We really enjoyed our stay, home could not have been better. Enything was exactly as advertised. The condo was immaculate, Pool was fantastic, and the views were breathtaking. The slip was more than accommodating for our boat and Johnna was the most gracious and accommodating Host that I have ever dealt with. I would definitely stay here again. Thank you!!! We look forward to your return in the future.....you will ALWAYS be welcome at our "home away from home!!!"